*Note: I originally wrote this post in August, 2011 on my old blog. I am updating and reposting it here, in hopes of getting my blogging creative juices flowing. Last August, I was at my local Barnes & Noble doing some work. Ok, you’ve got me. I was SUPPOSED to be doing some work, but in truth, like so many of my students, I was Facebooking instead. For some reason, I started messing around with the “pages” option, and I decided to make a page for my class. I wasn’t quite sure what would happen with it, but I thought if nothing else, I could spend the next hour fiddling around with that rather than writing lesson plans. I ended up with my class Facebook page. I think I uploaded a photo of my classroom, wrote a silly status message about how no one would “like” it, finished my grande skinny decaf caramel macchiato, and called it a day. 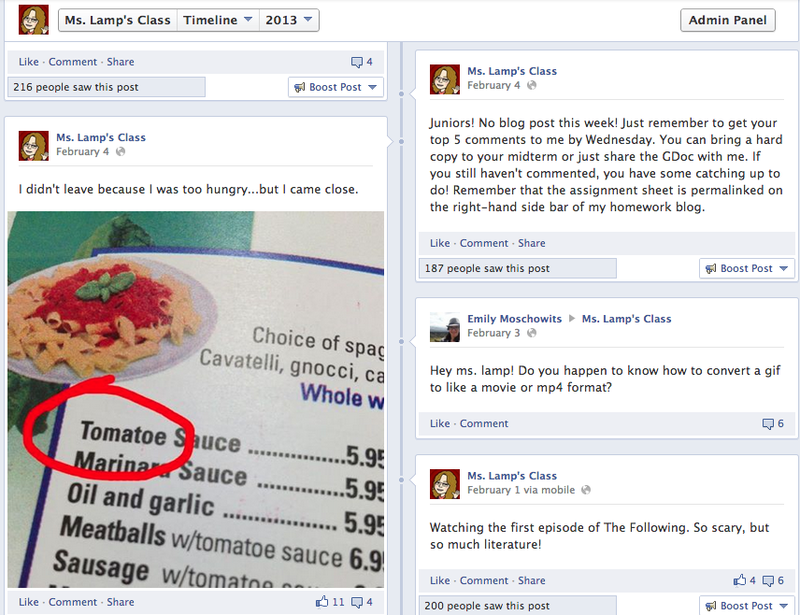 Three hundred and twelve “likes” later, I have to say that the class page was the best thing I could have done that day. As the year progressed, I realized that what had started out as a way to procrastinate had somehow transformed my classroom. It became a way for students to communicate with me in a way that they enjoy. I chuckled every time students interact with my page during the summer months…so much for “no more teacher’s dirty looks”! Below are just a few of the ways I have come to utilize a Facebook class page. It is called SOCIAL media, after all. Even though I’m not comfortable with “friending” current students on Facebook, the class page enables me to interact with them and get to know them better than I normally would. The public nature of the posts/comments engages a variety of students and gives me a chance to communicate with them in a different way. I love to post links for my students, from SAT tips to literary puns to news articles about my favorite authors. These links do not necessarily have to relate directly to class. I share links with news about the upcoming literary films, funny comics that I think the kids will like, music videos, and other things that I happen to find interesting. Inspired by FridayReads, I decided to post a status on my page on Fridays and ask students what they’re reading. Sometimes I get 20 or more comments. Sometimes I get zero. Either way, I think it’s an easy way to get kids fired up about what they’re reading and share their latest literary conquests with their friends. It’s also a great excuse to share what I’m reading with them! I don’t know why I was so surprised when kids started posting homework questions on my timeline. I guess it’s because I just saw the class page as a fun thing rather than a work thing. Eventually, students started using FB to reach me instead of the email system that our school provides to all staff and students. A couple of students remarked on my course evaluation that they liked when others asked questions because they often were wondering the same thing but were too afraid or lazy (their words, not mine) to ask. I hope this never happens again, but when our district was affected by Superstorm Sandy, social media was invaluable. I was able to keep stakeholders informed and get updates about how students were doing, and we kept in touch during the two weeks that school was closed. I think it brought us all a sense of comfort to know that we missed each other. In fact, a FB conversation led to a meet up at a local mall. Over thirty students and a bunch of teachers showed up! I know that I for one felt that I started to heal because of that day. Students often post links to my class page, and I especially (selfishly) love this because it’s enabling me to gather lots and lots of supplemental resources to use for years to come. I mean really, how cool is it when a kid posts a link to a web comic about Pride and Prejudice at 2am on a Saturday night? If that’s not taking learning beyond the classroom walls, I don’t know what is. I know that social media in the classroom can be scary. I’m a huge techie, and it even took me a couple of years to feel comfortable communicating with my kids in this way. However, this is their world, and even though students have started to move more to Twitter than Facebook, the point is that social media is here to stay. (Perhaps Twitter in the classroom will be my next post!) If we don’t get over our fear and guide our students in safe and appropriate use of media, who will?